Ragweed is the common name for any of the various wind-pollinated, flowering plants comprising the genus Ambrosia in the sunflower family (Asteraceae), characterized by small, greenish flower heads and erect, basally branched stems growing in large clumps. Ragweeds occur in temperate regions of the Northern Hemisphere and South America. Also known as bitterweeds and bloodweeds, ragweeds are classified into about 40 species worldwide. The scientific name of this genus is sometimes claimed to be derived from the Ancient Greek term for the perfumed nourishment of the gods, ambrosia (ἀμβροσία), which would be ironic since the genus is best known for one fact: its pollen produces severe and widespread allergies. However, the generic name is actually cognate with the name of the divine dish, both being derived from ambrotos (άμβροτος), "immortal." 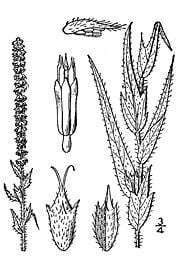 In the case of the plants, this aptly refers to their tenaciousness, which makes it hard to rid an area of them if they occur as invasive weeds. Despite this important negative impact on humans, ragweeds do have valued ecological functions. The seeds are an important winter food for many bird species, and ragweed plants are used as food by the larvae of a number of Lepidoptera (butterflies and moths). Other animals, such as some ungulates, also will forage on ragweed, and various birds and small mammals will use it as habitat or for nesting material. Even humans have found positive values. Native Americas have used the plant medicinally, with a tea made from the leaves used to treat swelling, vomiting, bowel cramps, and colds, and a salve used to treat skin sores. Ragweeds are annuals, perennials, and shrubs and subshrubs (called bursages), with erect, hispid stems growing in large clumps to a height of usually 75 to 90 centimeters (29.5-35.5 inches). Common ragweed (A. artemisifolia) is the most widespread of this genus in North America and attains a height of about a meter (three feet). 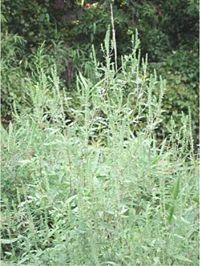 Great ragweed ("Horseweed"; A. trifida) may grow to four meters (13 feet) or more. The stems of ragweeds are basally branched. They form a slender taproot or a creeping rhizome. The foliage is grayish to silvery green with bipinnatifid, deeply lobed leaves with winged petioles; in the case of Ambrosia coronopifolia, the leaves are simple. The leaf arrangement is opposite at the base, but becomes alternate higher on the stem. As with other members of the daisy family, Asteraceae, ragweeds are characterized by an inflorescence is the form of an involucrate capitulum or flower head; that is, a densely packed cluster of numerous, small, individual flowers, usually called "florets." Ambrosia is a monoecious plant: it produces separate male and female flower heads on the same plant. The numerous tiny male inflorescences are yellowish-green disc flowers about three millimeters (0.1 inches} in diameter. They grow in a terminal spike, subtended by joined bracts. The whitish-green single female flowers are inconspicuously situated below the male ones, in the leaf axils. A pappus is lacking (Payne 1963). After wind pollination, the female flower develops into a prickly, ovoid burr with nine to 18 straight spines. It contains one arrowhead-shaped seed, brown when mature, and smaller than a wheat grain. This burr gets dispersed by clinging to the fur or feathers of animals passing by. There are about 41 species worldwide. Ragweeds prefer dry, sunny grassy plains, sandy soils, and grow along river banks, along roadsides, disturbed soils, vacant lots, and ruderal sites. Many are adapted to the arid climates of the desert. Burrobush (A. dumosa) is one of the most arid-adapted perennials in North America. About ten species occur in the Sonoran Desert. Each plant is reputed to be able to produce about a billion grains of pollen over a season and is anemophilous (wind-pollinated). The pollen is highly allergenic, generally considered one of the greatest, if not the greatest allergen of all pollens, and the prime cause of hay fever in North America. Common ragweed (A. artemisiifolia) and Western ragweed A. psilostachya are considered the most noxious to those prone to hay fever. Ragweeds bloom in the northern hemisphere from early July to mid-August or until cooler weather arrives. A plant usually produces pollen more copiously in wet years. When the humidity rises above 70 percent, however, the pollen tends to clump and is not so likely to become airborne. On dry windy days, the pollen will travel many kilometers. Goldenrod is frequently blamed for hay fever, but simply happens to have a showy flower that blooms about the same time. Goldenrod is entomophilous, in other words, insect pollinated. Its pollen is heavy and sticky, and does not become airborne. Some high mountain and desert areas of North America used to be refuges for severe hay fever sufferers, who would go to such areas for relief during the pollen season; however, increased human activity, such as building and other disturbances of the soil, irrigation, and gardening, have encouraged ragweed to spread to these areas as well. Today, no area in the United States is ragweed pollen free, and moving can only offer a degree of relief. 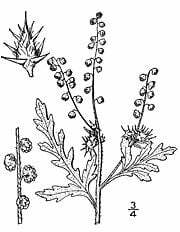 Ragweeds—mainly common (A. artemisiifolia), Western (A. psilostachya), and great ragweed (A. trifida)—were accidentally introduced to Europe during World War I; they thrived and have greatly spread since the 1950s. Hungary is currently the most heavily affected country in Europe (and possibly the entire world), especially since the early 1990s, when abandonment of communist-style collective agriculture left vast fields uncultivated, which were promptly invaded by ragweed. Anecdotal claims are made of honey giving some relief for ragweed pollen allergies, which is noteworthy because honeybees very rarely visit ragweed flowers, and even then only for pollen. However, during ragweed pollen shed, the pollen dusts every surface, and honeybees, being electrostatically charged, will accumulate some ragweed pollen. The pollen is frequently identified as a component of raw honey. The major allergenic protein has been identified as Amb a 1 (Ivanciuc 2007), a 38 kDa nonglycosylated protein composed of two subunits. Other allergens widespread among pollen—profilin and calcium-binding proteins—are also present (Wopfner et al. 2005). Total eradication of ragweed is considered impossible, owing to the plant's frugality and tremendous seed-producing capability. As of 2005, there is no known safe biological control to be used against ragweed in the open. Mechanical and chemical methods are available and can be used to control its spread, although there is evidence that these are actually no more effective in the long run than leaving the weed alone (Lewis (1973). The act of manually uprooting ragweeds, sometimes shown in the media for public awareness purposes, promises more than it can deliver. It is ineffective, and skin contact may cause the onset of full-blown hayfever symptoms in persons with latent ragweed hyper-sensitivity. That being said, ragweed is best uprooted in late spring, before the flowering season and before a strong root system has developed. Although the scythe and its motorized descendants have a reduced efficiency against ragweed, they remain indispensable tools, especially in populated areas and near delicate plantation, where herbicides use must be limited. Fighting ragweed with the scythe is a continuous process, because it is difficult to cut the plant right at the soil level, and the plant will regrow in two weeks (and often branch into three or four full-sized stems) if more than half an inch of the plant remains above the ground. Areas where ragweed has been reaped should be mowed down every three weeks to prevent regrowth. It is considered important to control the spread of ragweed in large abandoned or uncultivated areas. Ragweed pollen can remain airborne for days and travel great distances, affecting people hundreds of miles away. One efficient method for large-scale ragweed extermination is chemical spraying. Because ragweed only reacts to some of the more aggressive herbicides, it is highly recommended to consult professionals when deciding on dosage and methodology, especially near urban areas. Some proven effective active ingredients include those that are glyphosate-based (Roundup, Gliphogan, Glialka), sulphosat-based (Medallon) and gluphosinat-ammonia based (Finale14SL). In badly infested areas, usually two to 6.5 liters of herbicides are dispersed per hectare (approx. 0.2 to 0.7 US gallons per acre). One favored method of controlling ragweed in the past was cutting it, leaving the cuts in the field, then burning them there once the stalks have dried (Lewis 1973), since standing, live ragweed, will not burn effectively. It has become less popular today because the smoke produced is seen as unacceptable pollution, as with the decline in leaf-burning and trash burning. But the method has the added benefit of killing off the stems so the plant does not grow back, which (as noted above) is otherwise almost inevitable. Jerusalem oak goosefoot (Chenopodium botrys) was formerly classed in the genus Ambrosia, with the binomial name Ambrosia mexicana. Everitt, J.H., R.L. Lonard, and C.R. Little. 2007. Weeds in South Texas and Northern Mexico. Lubbock, TX: Texas Tech University Press. ISBN 0896726142. Ivanciuc, O. 2007. Allergen Amb a 1 University of Texas Medical Branch. Retrieved December 8, 2008. Lewis, A.J. 1973. Ragweed control techniques: Effect on old-field plant populations Bulletin of the Torrey Botanical Club 100(6): 333-338. Payne, W.W. 1963. The morphology of the inflorescence of ragweeds (Ambrosia-Franseria: Compositae) Am. J. Bot. 50(9): 872-880. Retrieved December 9, 2008. Wopfner, N., G. Gadermaier, M. Egger, R. Asero, C. Ebner, B. Jahn-Schmid, and F. Ferreira. 2005. The spectrum of allergens in ragweed and mugwort pollen International Archives of Allergy and Immunology 138(4): 337-346. PMID 16254437. Retrieved December 9, 2008. This page was last modified on 23 June 2015, at 16:07.